No one has learned this refrain better than eager candidates from the Western Balkans. There, the idea of joining the European Union has been put on a pedestal. Europe symbolizes everything that is good, as opposed to the wicked backwardness of Balkan imperfection. Countries there need to constantly strive to democratize and reform in hope that they can one day join. As much as this idea is unreservedly accepted, it appears that it is not fully corroborated by facts on the ground. Some of the countries in the (geographic) Balkans that seem to have very serious issues with respect of minority rights are in fact European Union member states. Both Greece and Bulgaria adamantly refuse to recognize their Macedonian minority. Both countries have lost cases before the European Court of Human Rights in Strasbourg. They continue to stubbornly refuse to comply with the court's decisions to allow the registration of the political parties of their Macedonian minorities. At the same time they do not have a problem using their leverage as members of the European Union to impose unprincipled conditions on Macedonia. Greece has already made a name for itself doing just that. Bulgaria shows signs it might take the same road. Last month Greece vetoed Macedonia's entry into NATO over the name dispute. Athens opposes the use of the name "Macedonia" by Skopje, as Greece claims it is exclusive part of its cultural heritage. Greece threatened it would also block Macedonia in the European Union unless a solution to the name dispute is found that is to its liking. Greece's move pushed Macedonia into political crisis. The government called early elections. Europe has been continuously labeling Turkey (non-European Union state) as a rogue with regards to human rights standards, but (the few) Armenians in Turkey have their churches and schools. Greece's denial goes so far that it does not even allow the free self-determination of the Macedonian minority, let alone start to discuss standards in education, use of mother tongue, or political participation. Last month the European Free Alliance, a European political party, staged an event in the European Parliament to protest this discrimination in Greece and called the Macedonian minority there one of the "last unrecognized minorities in Europe." In Albania (non-European Union state), often described as the most backward country in Europe, the small Macedonian minority freely votes their own and has a mayor in the region of Mala Prespa. In Bulgaria, a novel member of the European community of values, around a hundred members of the unrecognized political party of the Macedonian minority O.M.O. Ilinden Pirin were called by the police for "talks" last week, because they engaged in organizing a small historic commemoration. A classical tactic of police intimidation. Trying to play an honest broker and stabilize the Balkans, the United States pushed hard to get Macedonia into NATO but could not fight the Greek veto. In the process even Washington got entangled in the primitive Balkan nationalisms that simply refuse to accept that people are free to declare as they wish. State Department official Daniel Fried during his recent visit to Athens had to argue with the Greeks over this purportedly basic human entitlement. His counterparts reportedly told him there was no such thing as Macedonians. His answer, rephrased, involved something like "Oh, but I was there last week. I saw them." State Department spokespeople get into semantic discussions on a regular basis with a legendary Greek journalist at press briefings over whether there is a Macedonian identity, nation, or language. 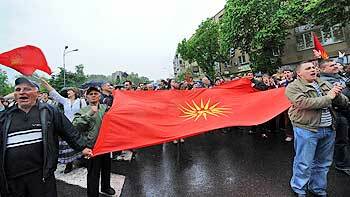 For Greeks, Macedonians are "Slavs" who are stealing Greece's history by calling themselves Macedonians. For the Bulgarians, they are Bulgarian kin who have been brainwashed during Tito's Yugoslavia, and think they are Macedonian, but are actually Bulgarian. The European Union has been way too condoning of Greek discriminatory demands pointed against Macedonia. Back in 1992 it adopted an infamous Lisbon document that said the new country could not use the name "Macedonia" and it postponed its recognition. It softened over time in view of reality. Macedonia was recognized by the United Nations in 1993, under the provisional name of "former Yugoslav Republic of Macedonia" (FYROM). Over the years the European Union has not showed a sign of willingness to deal constructively with the issue. Only last week one of its committees had to change in a document all reference to "Macedonian language" or "Macedonian culture" to "the language of FYROM" and so forth, in face of Greek pressure. The bottom line is that one should be free to declare as she or he feels. That is the substance of the right to free expression of identity. Restrictions to this end, whatever the pretext or ideology, are limitations of freedom and serious infringement of democratic standards. If on top of that the people subject to such restrictions are made to fear to speak their language in public, or have no schools for their kids in their mother tongue, or even fear persecution, for them the society they live in is not democratic. One must be free to declare as he or she wants. The same way the European Union promotes democracy abroad, it needs to do it in its own yard. If judicial action is not enough and it obviously isn't, Brussels must take more-decisive political action and demand that its members recognize minorities. View the Worldpress Desk’s profile for Risto Karajkov.